Back in October, I noted self-described “police whistleblower” Jon Wedger’s increasing interest in Satanic Ritual Abuse allegations, following his video interview with Vicky Ash, a supposed “survivor” associated with the evangelical SRA conspiracy theorist Wilfred Wong. Wedger has now followed up with a feature-length livestream with Wong himself, held in the grounds of an unidentified Victorian church in north London. Wedger’s descent into the most lurid sensationalism was probably always inevitable, but the immediate context here is that Wedger appears to have become increasingly vexed by critics and sceptics online and in the media. He refers in particular to the Hoaxtead Research blog and also to “a periodical” – the latter obviously a reference to the current issue of Private Eye magazine (No, 1492, p. 38), which carries a short article (“It’s a Brees”) referencing his association with the new Edward Heath accuser Mike Tarraga. Wong helpfully suggests to Wedger that critical journalists and sceptics are themselves involved in Satanic Ritual Abuse and will soon be “exposed”; such a glib explanation is a natural outgrowth of Wong’s unreconstructed 1980s “Satanic Panic” worldview, which extrapolates from various phenomena – the transgressive showmanship of Aleister Crowley and Anton LaVey, the existence of the law-abiding Church of Satan, and a few old cases where sexual abusers apparently acted out stereotypical Satanic tropes, for whatever reason – into wild claims about Satanic covens that supposedly exist in “every town and village” in the UK, with all levels of society “infiltrated” by Satanic abusers and killers. 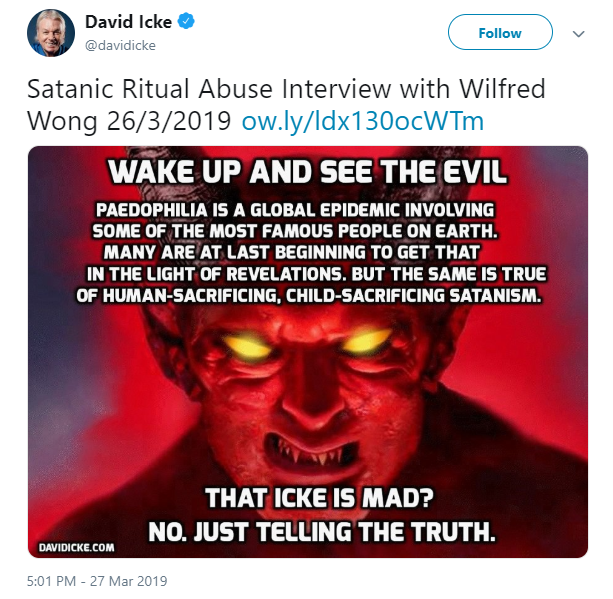 Wong’s continuing promotion of the Hampstead Satanic Ritual Abuse hoax is particularly callous, given that he must know of the suffering experienced by parents and teachers who were identified and falsely accused by Sabine McNeill. Edward Heath looms large in the discussion – Wong believes that Heath was a Satanist prime minister, thus proving the extent of Satanism in the UK, while Wedger, it seems to me, hopes that by continuing to highlight allegations against Heath he will in due course ingratiate himself with Mike Veale, the former Chief Constable responsible for the Operation Conifer fiasco (Wedger claims to be in contact with Veale, but nothing in the public domain shows that Veale has responded to his overtures). Wedger now says that he has found two new Heath accusers: one of these is the aforementioned Tarraga (not mentioned here by name), while the other is a woman who according to Wedger says she was abused by Satanists at parties, but that she had been excluded from one that was just for boys – according to her, this particular party was “being set up for Ted Heath”. There was one case, a guy come to me and he was sent to an approved school in east London, and he was abused, and he remembers it was ritualistic, there was Pentagrams on the floor, and it was a caretaker that was doing it. And that was in a residential school, and he was subject to it, as was his brother and many other kids. The context here is again suggestive of Tarraga, who was raised in care along with his brother, and who attended an approved school. Tarraga was in Harwich in Essex rather than London, although the location is about 90 miles northeast of London. Such a story, though, does not appear in Tarraga’s revised memoir, which was produced under Wedger’s guidance. UPDATE: The interview has now been advertised by Andrew Cheetham on David Icke’s website. Icke’s own Twitter feed has also promoted it (or rather, used it to promote himself) via one of his lurid memes. Out of curiosity I’ve read the revised Tarraga memoir: it has no ritual abuse or Pentagrams. Perhaps they’ll appear in a re-revised edition one day, rather as the Heath story suddenly turned up in this edition.